Okay, so we all know that toddler and baby toys are ridiculously expensive but do they all have in common? Sensory objects. On nearly every baby and toddler toy there is something that has them experiment with one of their senses, sight(mirrors), sound (rattles) or touch (soft, rough). So, instead of spending all that money you earn on expensive baby toys here’s an inexpensive activity for you and your youngster. DIY Sensory Bags. These are very easy and cheap to make and the bonus is.. (as always) you can make it however you want! You may use either a quart or gallon size zipbag depending on how large you would like it to be, the one pictured is quart, but always use a freezer bag. Freezer bags are thicker than the normal sandwich and storage bags, so they won’t tear as easily. We don’t want these bags to tear, what a mess. Fill your chosen bag with your liquid. It doesn’t really matter what type of liquid you choose just as long as it’s thicker than water. I’ve found hairgel is the best texture wise but dish soap works as well, plus it makes bubbles. You can buy your liquid colored, add coloring or leave it clear whichever you prefer. Next, add your chosen contents to the bag. You will want to vary the contents, size, texture and color so that the bag stays interesting to your little one. Like a game of “I Spy.” At the bottom of this post are some sample bags and the ingredients I put in them. Once you’ve added all your contents to your bag squeeze the excess air out and zip it up tight. Now, take the packing tape and tape up all four edges of the bag as an extra precaution against tiny muscles. Voila! You have made your little one a cheap and easy sensory toy. They will get so many hours of squishing the bag around because it feels funny and as they grow into toddler ages you can start to play games with them. And I dare you to try not to squish it around yourself! They’re irresistible! You can make your bags themed or educational as well. Such as a beached themed bag with a blue liquid, shells, sand and foam sea animals. Or a “I Spy” letters bag with all the alphabet letters and they try to find the one you name or for smaller toddlers a shapes and colors bag. 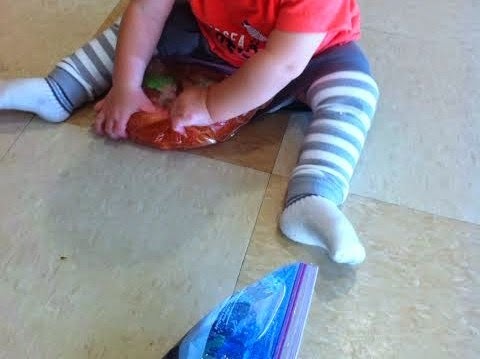 **TIP: If your infant tries to chew on the bag, tape two opposite sides to the floor and sit them in front of it or do some bellytime! ** Please don’t ever leave your child unattended with these bags. Accidents happen with even the best made projects. Here are some examples of the ones we made! 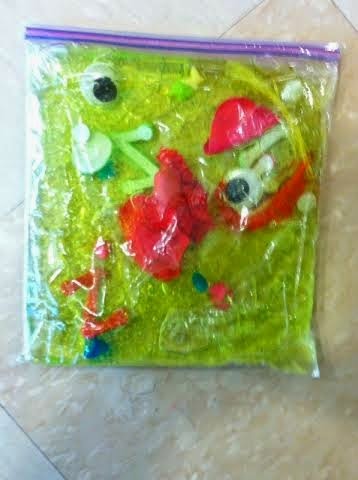 This bag contains green hair gel, foam letters, googly eyes, beads, rose petals, feathers and a balloon. 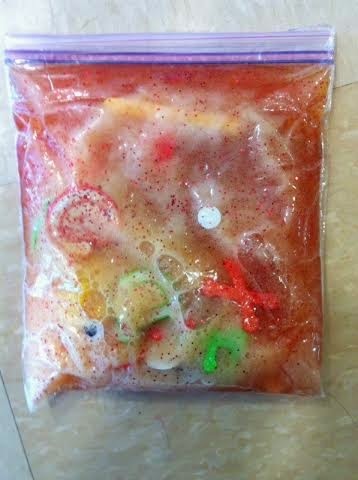 This bag contains orange dish soap (which turns bubble when they start squishing it), foam letters, googly eyes, a balloon and feathers. 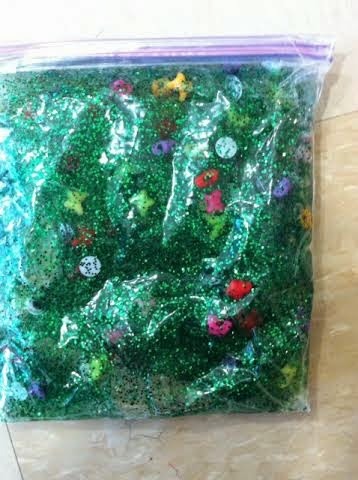 This bag contains green hair gel, green glitter, butterfly beads and googly eyes. 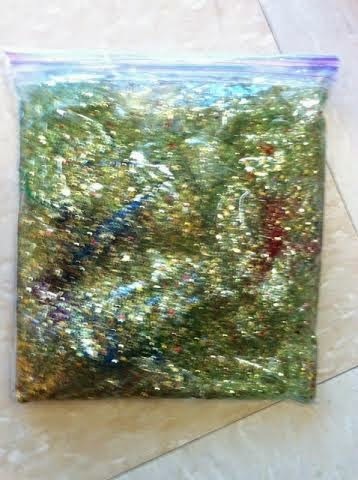 This bag contains blue hair gel, gold glitter and feathers. 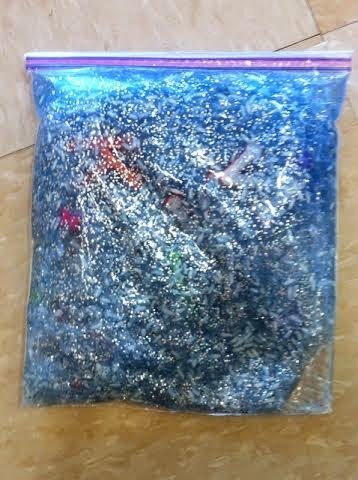 This bag contains blue hair gel, silver glitter, rice, foam letters, feathers and beads. The ideas and possibilities are endless! So grab your little one and start creating some fun!